Did you know that when you are in an auto accident, there is a 1 in 84 chance you may die? However, that number is lowered by 50% with just the use of a seat belt. With those kind of numbers, you want to make sure you are always using your seat belt when driving or riding in a vehicle. You should always use a seat belt but how does a seat belt work? Here is a basic break down. The seat best system is consisted of webbing that is connected to a retractor mechanism. A spool is attached to one of the ends of the webbing as well, being the main element in the retractor. Inside the retractor is a spring that applies torque to the spool causing it to rotate. This winds up any loose webbing that may remain. A locking mechanism exists in the spool to stop it from rotating. This can be triggered by the vehicles movement. The spool gets locked when the vehicle decelerates very quickly such as in the event of a collision. A jerking motion on the seat belt webbing can also trigger the retractor. A pretensioner does the job of tightening the seat belt webbing in some newer systems. However, the pretensioner works together with the regular locking mechanisms, rather than in place of them. Unlike the usual locking mechanism that keeps the belt from extending any further than it was before a collision, a pretensioner actually tightens any and all slack. This helps put the individual firmly in their seat when an accident occurs, minimizing damage. So how does a seat belt work? Simply put, it senses a collision, tightens at that moment, minimizing your movement during the accident. Seat belts are a very important component in any vehicle. 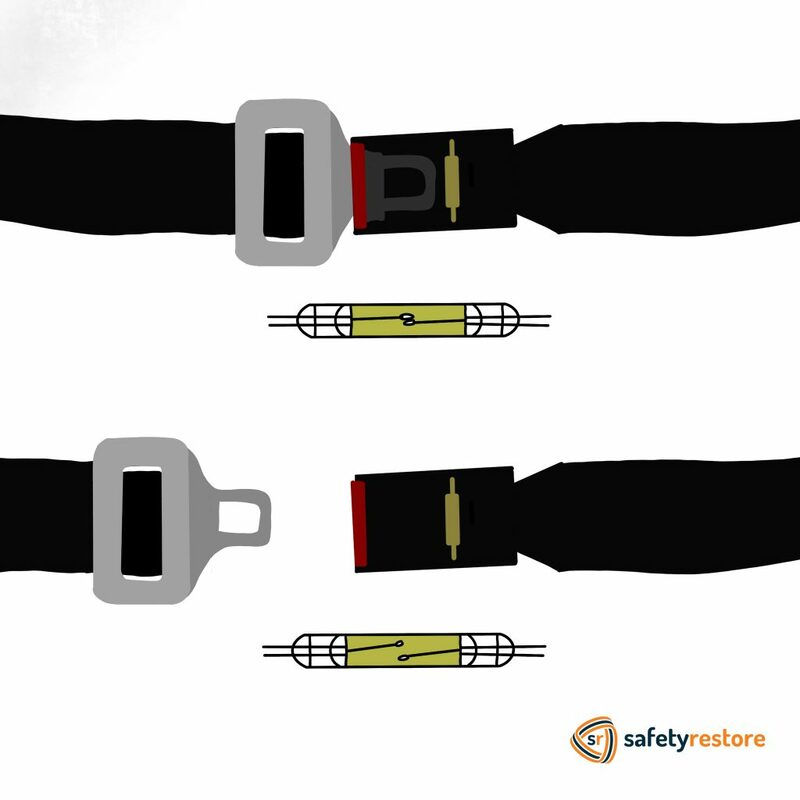 If your seat belt is in need of repair or replacement, visit SafetyRestore.com : a professional seat belt repair company. They will help you stay safe on the road. Wondering how seat belt sensors work? When you are unbuckled in your seat, have you seen the seat belt sign go off? Ever wonder how seat belt sensor works? Seat belt sensors/switches are used in various industries including the automotive and the airline industries. They may soon even become mandatory on buses and trains as well. A vehicle can include several types of sensors: weight sensor passenger seat, speed sensor, and connection sensors in buckles. There are conditional actions that are based on the sensors state. They cause the dash indicator light to light up or for the alarm to go off inside. The Reed Switch exists inside a seat belt buckle and determines whether or not the passenger is wearing their seat belt. It has been known by seat belt designers as being the most reliable way to detect if the seat belt has been engaged. If your vehicle can turn the airbag on or off by its own, the sensor can light up the airbag display stating if it is active or not. This occurs when it senses that their is pressure on the seat, someone is sitting on it, but has not put on their seat belt. The sensor inside the seat belt buckle also can light up the symbol resembling a person belted into their seat. This occurs when the passenger is not buckled in their seat. Knowing how seat belt sensors works, it is important to make sure all your vehicle’s safety components are working and are in good condition. You want to make sure your vehicle can sense everything going on inside the vehicle, and can make the proper adjustments to make sure you are fully protected in the event of an accident. Safety Restore is a company that specializes in restoring seat belts. They can rebuild locked and blown seat belts for all makes and models within 24 hours. You can relax knowing that Safety Restore will keep your vehicle working properly, keeping you safe on the road. Since seat belts are the main line of defense in keeping you safe during an accident, it may be a good idea to know how seat belt mechanism works. 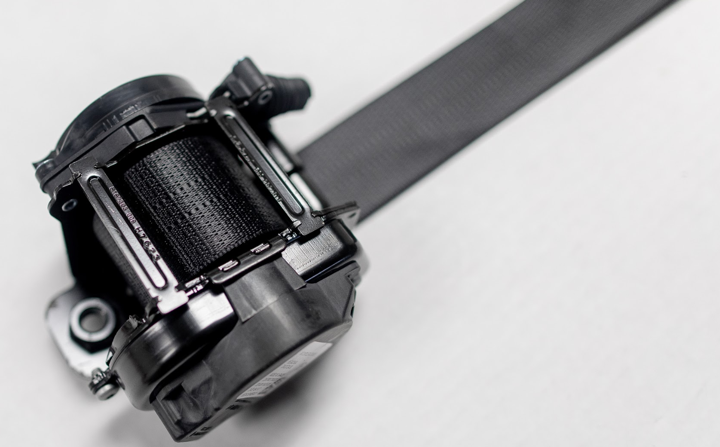 In a conventional seat belt system, the seat belt webbing is connected to a retractor. The spool, being one of the main elements in the retractor is attached to one of the ends of the webbing. Inside the retractor is a spring that applies torque to the spool, causing the spool to rotate, winding up any loose webbing. The seat belt retractor also has a locking mechanism that stops the spool from rotating. The retractor can be triggered by the car’s movement. The spool locks when the vehicle decelerates rapidly, like when the vehicle is in a collision. The retractor can also be triggered by something jerking the seat belt webbing. This can occur even if someone pulls the seat belt to quickly when buckling themselves in. In some newer seat belt systems, a pretensioner does the job of tightening the seat belt webbing. However, it works together with the conventional locking mechanisms, rather than in place of them. 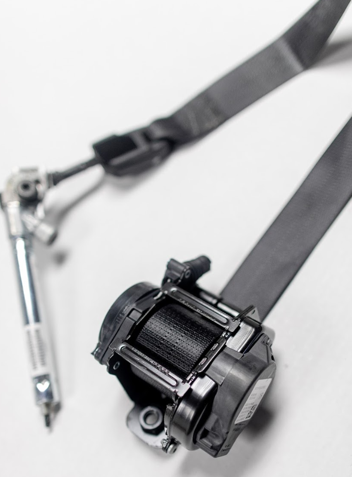 Unlike the conventional locking mechanism in a retractor that simply keeps the belt from extending any further than it is before the accident, a pretensioner tightens any slack that may exist.When an accident occurs, the gas in the pretensioner flares. This creates pressure that builds up, which then rotates the retractor. Pulling back any slack in the seat belt puts the individual firm in their seat. This helps minimize the damage that person may receive during the accident. Now that you know more about how seat belt mechanism works, it is safe to say that it is important to have all the mechanisms working and in good condition. If you are ever in an accident, you want to be fully protected. 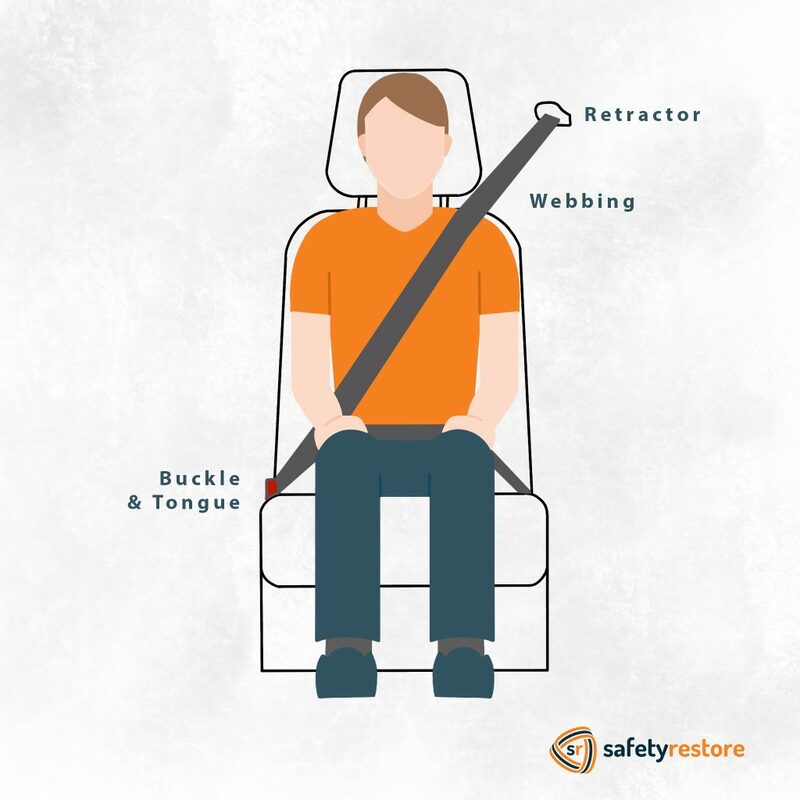 Safety Restore is a company that offers many services including seat belt webbing replacement, seat belt repair, airbag module reset, and more. They repair with 100% OEM parts and have a lifetime warranty. Stay safe on the road and make sure your seat belt is working properly. What is a seat belt buckle ? Find out by reading below. Even if you are not employed as a mechanic or find special interest in automobiles, it is important to know the basics when it comes to cars. After all, you probably drive one every day. If something were to go wrong with your vehicle, you’d want to know what the problem is yourself, instead of wasting a lot of time just to get the problem looked at. Below I will teach you about one of the most important components of your seat belt: the buckle. The seat belt buckle is also referred to as the seat belt pre-tensioner. Basically, it is the female portion of the seat belt which the seat belt retractor—or seat belt tongue—plugs into. Most seat belt buckles do not come with a gas charge, but some certainly do and this serves them as a secondary restraint. On a side note, a gas charge is a small explosive mechanism that is manufactured into a seat belt and goes off when a collision occurs. Whereas many vehicles have a gas charge only on the seat belt retractor, some also have them in the buckles. If the gas charge goes off in an accident, the seat belt buckle pretensioner will need to be repaired. You will also be able to tell if your seat belt pretensioner is bad by visually inspecting the buckle and noticing that it has a compressed, or squished in, look. Additionally, if you own an OBD airbag scanning tool, this could be used to properly scan your vehicle’s system and tell if there are any codes indicating that the buckle needs repair. Seeing as how important the seat belt buckle is, it is important to get it fixed immediately if you see any faults with it. However, this is a job that you should entrust to a professional rather than attempting it on your own. A skilled company you can turn to for quality seat belt buckle repair is Safety Restore. With Safety Restore, you can expect quality work, affordable prices, fast turnaround time, and a lifetime warranty guarantee! Visit safetyrestore.com to order the buckle repair service! Since seat belts are one of the most critical safety mechanisms in our vehicles, it makes sense that we should know all about how they operate. We should know each component in the seat belt mechanism so that if something were to happen to any of the individual parts, we would be able to determine the cause and get it fixed immediately. Below I will go into detail about one of the most important components of the seat belt—the retractor. To start off with, every car that has been manufactured in America after the year 1995 is equipped with at least one seat belt retractor. Basically, the retractor is the male portion of the seat belt where the actual seat belt webbing material feeds out of. 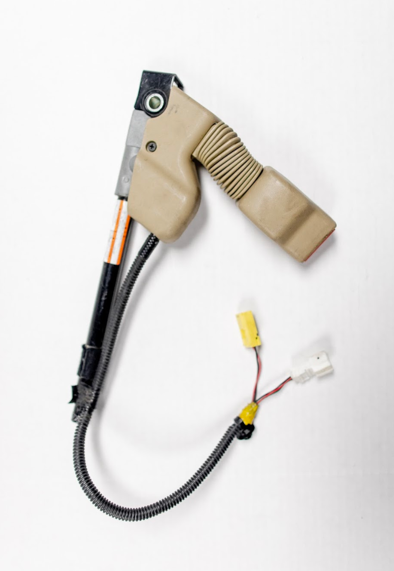 The seat belt retractor is made up of a spring, some gears, a sensor, a pyrotechnic explosive device, and a mechanism that is engineered to also lock up when a crash or accident occurs. The seat belt retractor is responsible for locking up in the case of a sudden stop. It is also connected to the airbag system in a vehicle. When an accident occurs, the gas charge that it is equipped with goes off. This is programmed in a vehicle’s SRS airbag module and goes off immediately upon the crash sensor detecting the collision. Its primary design is to keep an occupant away from the airbag and seated against he seat securely to avoid injuries caused by the airbag. When a car has been involved in a crash, the seat belt retractor may become blown, meaning that it needs to be entirely replaced. Usually seat belts are equipped with only one gas charge so the seat belt will not function properly until the gas charge is replaced. Now that you know what the seat belt retractor is and what it does, you’ll hopefully know how to tell when it is broken and needs repair. If you do see that your seat belt retractor needs repair or know that the gas charge has deployed, know that there is someone you can turn to that knows how to fix seat belt retractors. 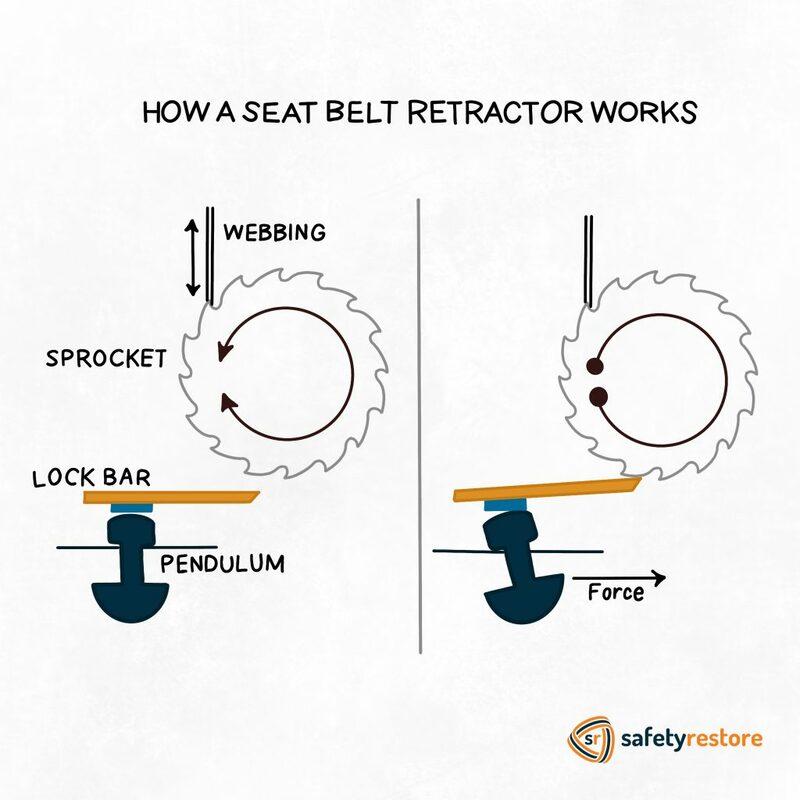 The company Safety Restore specializes in repairing seat belts, and has a service specifically for seat belt retractor repair. Visit safetyrestore.com to order this service online! What is the seat belt assembly ? You may be buckling in and out of your seat belt every day (and perhaps five or six times at that!) but have you ever stopped to think about the seat belt assembly and what the different parts that make up the entirety of the seat belt are? Today I will explain just that. There are a few main parts to the seat belt: the pretensioner, the retractor, the pillar loop, and the material webbing. All are equally important in the assembly and functionality of the seat belt. What is the seat belt assembly ? Read on. To start with, the pretensioner is one of the most important components of the seat belt. It is otherwise simply known as the seat belt “buckle”. This is the female part of a safety belt that secures and releases the retractor, or tongue, of the seat belt that is attached to the material webbing. It is manufactured to hold the retractor in a firm position so that it has no chance of unbuckling on its own. It also allows for the seat belt to be fastened and unfastened with very little force by the user. If someone needs to free themselves from their seat belt, the seat belt buckle should be easy to unbuckle and maneuver out of. Another important component that was briefly mentioned is the seat belt retractor. This is the male portion of the seat belt that actually fits into the seat belt pretensioner. It attaches to the material webbing. Of course, the material webbing is also very important. Seat belts are designed so that the webbing can reach across an occupants lap and over their chest and shoulders. This allows for the force from a possible collision to be spread across the body rather than be focused on one single area—thus causing more serious injury. Usually, the material webbing is made from polyester and has a large tensile strength to support quite a bit of weight. Finally there is the pillar loop. Although this portion of a seat belt is smaller in comparison to the other components, it serves an important function. It is used in 3-point seat belt systems and is located above the shoulder of an occupant. Its main purpose it to guide the webbing over the shoulder and across the occupant’s chest, so as to provide that maximum security that was mentioned above. If any of these seat belt parts become faulty or break in your vehicle, know that there is someone who can help. The company Safety Restore specializes in the repair of seat belts. They will be able to repair any and all seat belt related problems you may have with quality and safety in mind! What are seat belt extenders ? Wondering what seat belt extenders are? See for yourself in this image. If you find yourself struggling to buckle up in your seat, you may be in need of a seat belt extender. What are seat belt extenders? Seat belt extenders do just that, extend the seat belt. The tongue of your seatbelt goes into the buckle of the extender. The other side of the extender has its own tongue that then goes inside your vehicles buckle. There are a few types of seat belt extenders: regular extenders, rigid extenders, and adjustable extenders. Regular extenders fold smoothly around your body, just like your existing one would. It is made of a similar webbing material as well. These are the most typical seat belt extenders. Rigid extenders are made from a strong cable. Because of this, the extender stand uprights when buckled in – having little flexibility. 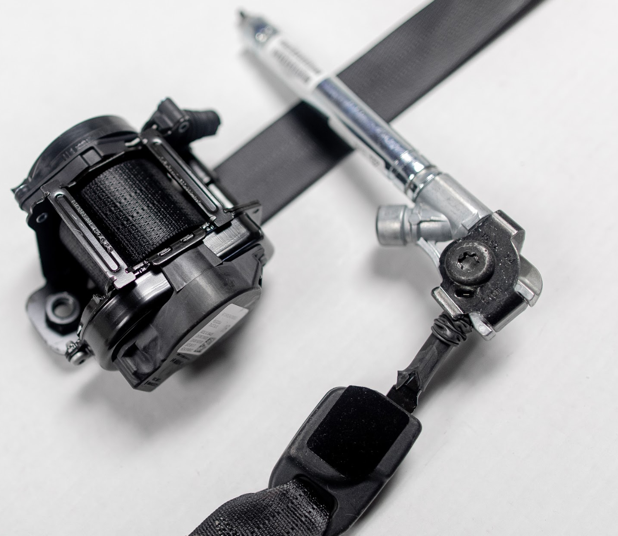 An adjustable extender is made from the same webbing the regular extender is. The main difference is that, unlike the regular extender, this one can adjust in length. Now that we have answered the question “what are seat belt extenders?” we can further learn where they are used. The following are some reasons as to why you would need a seat belt extender. Plus-sized people use seat belt extenders to lengthen there existing one simply due to the fact that it was not long enough. A regular extender would be great in this situation. People who have had rotator cuff surgery or have arthritis or even back injuries would benefit from a rigid extender. This is because it reduces the amount of rotation and reaching the person has to do to buckle up. Similarly, the elderly would benefit from a regular or rigid extender. Transportation providers like taxi or emergency medical transportation, can use adjustable extenders. Since the driver does not know who may be in the car or what need they may have, this extender is a good in between. It provides length when necessary but also gives works well in its short length, so there isn’t unnecessarily long length to the seat belt. Seat belt extenders are a great accessory in any vehicle and can help ensure the safety or comfort of an individual. What is seat belt webbing ? Wondering what seat belt webbing is? This image shows seat belt webbing and what it connects to. A seat belt is a critical component in the vehicle that keeps you safe in the event of an accident. However, when someone refers to a seat belt, what do you think of? Is it the entire system or just a part? A seat belt has several components. There is the seat belt retractors, seat belt buckles, seat belt tongues, pillar loops, and seat belt webbing. The job of most of these components are easy to guess based off of there names. Retractors do just that, retract the seat belt. It also locks the webbing in case when an accident occurs. Seat belt buckles, buckle: secring and releasing the tongue. The tongue is attached to the webbing and secures the seatbelt. The pillar loop guides the seat belt webbing over the shoulder and across the chest of the individual. But what is seat belt webbing? Seat belt webbing is the part of the seat belt that is pulled around the individual. It gets tightened by the retractor upon impact during an accident. Seat belt webbing is made from 100% polyester and has the strength to support more than 28 kNw or 6,000 lbs. It is manufactured to meet or exceed the safety standards of the automotive industry. Seat belt webbing does not shrink, rot, mildew or mold. However, it can get frayed, work, torn, or chewed up by a dog. If this does happen to your seat belt webbing, make sure to get it repaired by a company like Safety Restore. You want to make sure your seat belt is in fully working condition and can protect you in case of an accident. Safety Restore offers seat belt webbing replacement, and can even change the color of your seat belt webbing. They offer dozens of color options. All you need to do is visit SafetyRestore.com to get started. Select your service and ship your seat belt. 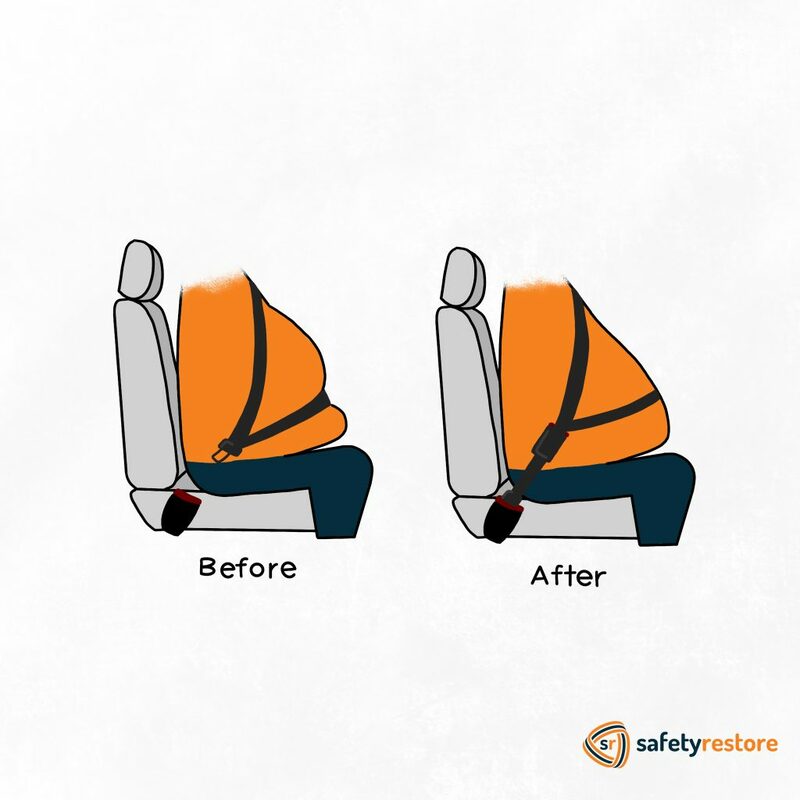 Once Safety Restore receives your seat belt, they will repair and ship it out within 24 hours! They use only OEM- quality seat belt webbing so you know it will meet or exceed the FMVSS standards. Now that you know what seat belt webbing is, make sure it can protect you the way it should. Visit SafetyRestore.com. Change your seat belt color! We offer custom webbing replacement to revamp your interior. Seat belts are an every day necessity that we have all come to realize and appreciate. With that knowledge, however, many of us use one when on the road but don’t actually stop to think about the physics behind them or how seat belts work in a crash. Below I will explain just that. It is important to know this type of information, especially when we owe a lot of our livelihood to their protection! Basically, seat belts help prevent serious injury or even death by decreasing the velocity of a body as it faces an unexpected decrease in speed. Because of inertia, an occupant of a vehicle will naturally continue travelling forward at the same speed of the vehicle before the impact, even once the car has reached a complete stop. If a car is travelling at the speed of 65 miles an hour and collides into a telephone pole—immediately reducing its velocity to zero—the occupant of the car will still keep moving forward at 65 mph, unless there is something holding them back as a “stopping force.” This can be explained as the velocities of the car and the occupant working independently of each other. When an occupant wears a seat belt, he or she is able to spread the stopping force needed to decelerate their body across their body, instead of having the force concentrate on one area. Most modern cars are equipped with three-point seat belts that spread the stopping force across the upper body and the pelvis. Seat belts also prevent occupants from hitting the steering column or windshield at high speed—which can result in quite serious injury and likely death. Seeing as how important seat belts are, it is crucial to have them repaired immediately upon detecting any faults in them. The company Safety Restore specializes in single stage, dual stage, and even triple stage seat belt repair. It also offers seat belt webbing replacement services, in case your problem lies in ripped, torn, or frayed seat belts. If you are ever in need of seat belt repair, you will be guaranteed quality, safety, and affordable prices at Safety Restore. Where is the seat belt sensor ? If you’re looking to learn more about the seat belt sensor circuit, I am here to help. There is a lot to learn when it comes to the seat belt sensor, and this is great information to know. To start with, the seat belts in a vehicle work alongside the airbags. Maximum protection is achieved when seat belts and airbags are functioning simultaneously. Without one, the other does not function at its greatest ability. It is especially important for seat belts to be worn when airbags go off. Otherwise, more injury can occur to an occupant from the airbag than from the accident itself. Oftentimes, the seat belt sensor is also used to trigger the airbag. The seat belt sensor can usually be found in a vehicle’s SRS airbag module, sometimes referred to as the ECU, or engine control unit. The SRS airbag module or ECU is usually located beneath the driver’s or front passenger’s seat, but it can be found in a few different locations as well. In some vehicles, it is found in the center console, kick panel, behind the steering wheel, or under the radio. The importance of the seat belt sensor is that it detects when the metal buckle of the seat belt is inserted into the female portion of the seat belt. If a car senses an occupant seated in the driver or front passenger seat, but the seat belt is not buckled in, oftentimes a persistent ding will go off until the occupant of that seat buckles in. Because the persistent ding can quickly become frustrating, this is a clever way to get people to wear their seat belts when in a vehicle. If you or someone you know is having trouble either with their SRS airbag module or with their seat belts, know that there is a solution. There is a company called Safety Restore that specializes in repairing seat belts and SRS airbag control modules. It prices its services affordably and guarantees quality work with a fast turnaround time. It also attaches a lifetime warranty on all services! Customers simply need to log onto safetyrestore.com and select the service they are interested in, before shipping out their unit(s) for repair.